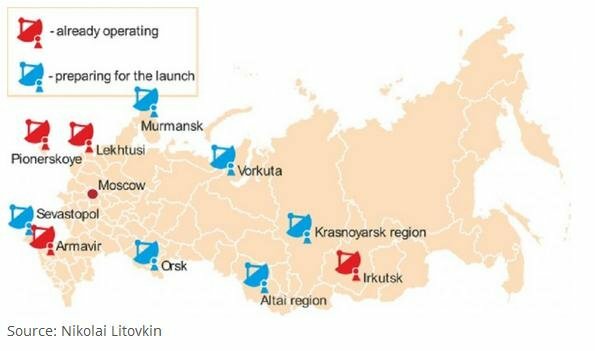 Russia is to install a heavy-duty radar station near Murmansk, not far from the border with Finland and Norway, to warn of potential missile strikes, according to Sergei Boyev, chief executive of the holding company that will construct it. The Voronezh-DM type radar station will be able to detect ballistic, space and aerodynamic objects, including cruise missiles. Boyev says the station “will cover the main missile-threat direction” in the western area. The Voronezh-type radar station allows the Russian Defense Ministry to see, in sectors, what is happening around Russian territory at a distance of up to 3,600 miles. The station is one of three elements of an integrated missile-attack warning system. The Voronezh type radar station, or those equivalent to it, he says, then tracks the warhead’s flight trajectory and aims the missile defense systems at the warhead. “The satellites record the launch and then we must determine where the missile is heading — to Russia or South America. It’s this system that gives the target designation to the antimissile defense systems. And such a radar station covers the distance from St. Petersburg to the U.S. coast,” added the source. While radar stations of the previous generation looked like ancient Egyptian pyramids, the current model is strikingly different. “The Soviet Daryal in Azerbaijan consisted of two cyclopean concrete structures: a 60-meter-high broadcasting center and a 100-meter-high ‘receiver.’ They were serviced by a hundred people and construction took 10 years and cost $1 billion,” the source from the Russian defense industry said. In his words, the Voronezh, with its “latticework antenna canvas-sail tucked under light siding and several containers with apparatus, looks like a Lilliputian next to the Daryal. The cost of the new station is estimated to be between $23 and $31 million. The station is serviced by 15 people. It is prepared, assembled and tested at the manufacturer. The modular cubes are then put together as a station on site and are configured to do their job. Since the early 2000s, Russia has been modernizing its missile-attack warning systems. To secure its borders, Moscow has had to replace the old stations from the Soviet period, as well as the facilities in the Baltics, Ukraine and Belarus that were lost after the collapse of the USSR. In 2008, a new Voronezh-type missile-attack warning system was deployed in the settlement of Lekhtusi near Saint Petersburg. It is capable of identifying all air and space objects from the coast of Morocco to Spitsbergen, an archipelago in the Arctic Ocean. The second station was launched in Armavir in Krasnodar Krai, 870 miles south of Moscow. It tracks events occurring in the area from North Africa to India. Similar missile-attack warning systems are now deployed in the Kaliningrad region in the settlement of Pionerskoye (800 miles west of Moscow) and near Irkutsk (3,200 miles east of Moscow). The first tracks missile launches from a “western direction”; the second – from the area from China to the west coast of the United States. The Russian Defense Ministry plans to introduce similar facilities in Krasnoyarsk Krai (2,600 miles east of Moscow) and Altai Krai (2,400 miles east of Moscow), as well as in Orsk (1,100 miles east of Moscow) and near Vorkuta (1,200 miles northeast of Moscow).